Let's welcome back New Jersey! Let’s welcome back New Jersey! Re-entering the Regional Greenhouse Gas Initiative (RGGI) makes a lot of sense for New Jersey. 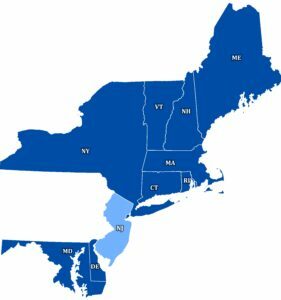 RGGI is a successful 9-state program that has led to important reductions in power plant greenhouse gas emissions and significant investment in energy efficiency. NJ was a founding member but dropped out of the program under Governor Christie. Now under Governor Murphy’s leadership, the state is planning to rejoin and reap the benefits of cleaner energy and expanded investment in energy efficiency. AMC has been a long-term supporter of RGGI because we recognize the serious dangers of human-caused climate change and the need to act both locally and globally. Climate-driven impacts in our region are ongoing and predicted to worsen. Outdoor recreation is just one of the things we care about that is being impacted by unpredictable and extreme climate changes. The proposed rules put forth by NJ will establish the state regulations that 1) Setup the cap and trade program, CO2 emissions budget, and pathway to reduce carbon from 2020 to 2030, and 2) Within the context of the existing Global Warming Solutions Fund establishes the framework for how the State will spend the RGGI-generated proceeds, emphasizing projects that will support communities disproportionally burdened by the impacts of a changing climate. There are two ways you can let NJ state officials know you want them to take action on climate: attend and speak at a public hearing or submit written comments (or both!). In your comments, AMC encourages you to emphasize your support for New Jersey’s efforts to address climate change by re-entering RGGI. We also suggest that you ask New Jersey to take a leadership role in reducing carbon emissions and investing in a clean energy future by setting an initial CO2 emissions budget that pushes beyond a level of current emissions and is more in line with emissions expected in 2020. Read AMC’s key talking points for more information. Public Hearing: For each proposal, there will be a public meeting held on January 25th.